Authors, I invite you to share a holiday-themed romance snippet on my other blog. The guidelines are here. I will update the post as frequently as time permits. This promotional opportunity is ongoing in 2016 or until otherwise noted. 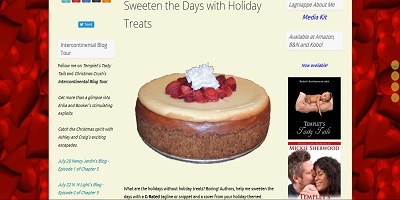 Readers, sample the Holiday Treats at Mickie's Mutterings http://mickiesherwood.com/blog/2015/12/14/holiday-treats/. There's always something good going on! We would love to hear from you. Come on over.